Russell Tours has been famous since our founding in 1991 by offering first-class hiking trips at the lowest prices. Many people ask how do we do it? Well, first, let’s look at some of our prices and our policies. All our prices include excellent breakfasts and dinners. Each trip price is unique based on the number of people in the trip and the length and variation of locations. We build a custom program for each of our hikers and try to offer a better offer for each location than any other company in the industry. All of our trips utilize at least three or four star hotels. All rooms with private bath. Referring to a hotel directory can easily check that. The only exceptions are back country trips that use cabannes or smaller hotels. We go to the best places. We stay in villages like Zermatt, Pontresina, Chamonix, Verbier, and many more superb destinations. We do not select unknown backwater villages where scenery and ambience is not first rate. We’ve been running these trips as volunteers for the Appalachian Mountain club and commercially under the name of Russell Tours since 1991. We have hundreds of repeat clients and we would be very happy to supply you with names and telephone numbers so that you can verify our tour quality. Our prices include rooms, 2 meals daily, and all ground transportation. Private rooms are available at an extra fee of $600 per week. Then, how do we do it? Probably, the most important factor in our cost-cutting is that we do not publish a glossy catalog. While our literature is rather homegrown, we value the savings for you rather than a nice catalog to look at. The next important point is that we do little advertising. Friends of friends and word-of-mouth has produced the largest number of our new clients. We enjoy a more than 50% repeat rate of our clients. We are strong advocates for using the internet which has becoming increasingly important to us in reaching prospective clients. As you know, the internet and email is not costly. When you compare our prices with those of any of our competitors you will be astonished. Sometimes we’re not just hundreds of dollars less, but half the price or more of other trips offered. We like that and know that you do too. I just returned from our Hiking trip in the Alps and I wanted to share some of our wonderful experiences. 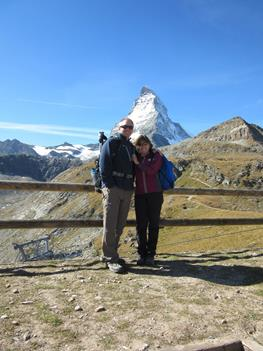 As you know we hiked from Chamonix ( France ) to Zermatt ( Switzerland ) along the Haute Route. First of all each of the Hotels and Cabanes you chose were easy to find, clean and Friendly. When we arrived at each location the hotel owners welcomed us warmly and showed us to our room. Dinners were always fresh and included soup, salad (fresh from the garden), an entrée, and dessert! The final hotel in Zermatt was the icing on the cake. The 4 star Mirabeau hotel included an exceptional room (with view of the Matterhorn ) and spectacular food. We even went for a nice swim in their pool. It felt like we were being rewarded for all of our hard work. Having traditionally been a backpacker both domestically and international, staying in hotels and traveling light (18 lbs each) was a pleasure. I want to thank you for your self guided service and advice. We are very proud of our low costs and high service. We will continue to offer you top-quality trips to the best locations, staying at the best hotels so you can enjoy a truly wonderful hiking vacation at the most reasonable prices.